The city of Mendota has put itself on the map with the addition of a Juicy Lucy to one of their restaurant’s menus. Lucky’s 13 Pub serves up what they’re calling the Juicy Lu Lu, made from hand made Certified Angus Beef, cheddar cheese, and with a side of hand-cut fries for $10.25. When you try it (of course you will) stop back to let us know how it rates on your Lucy Index. Directions to Lucky’s 13 Pub. In addition to traditional hamburgers, Burger Jones will offer veggie, turkey, buffalo, lobster, salmon and tuna burgers, Roberts said, and there will almost certainly be a unique take on the “Juicy Lucy” — a local favorite that puts melted cheese inside the beef patty. Find a discussion of this on Secrets of the City and send us any updates you hear so we can update the wiki. Oh, it’s on. 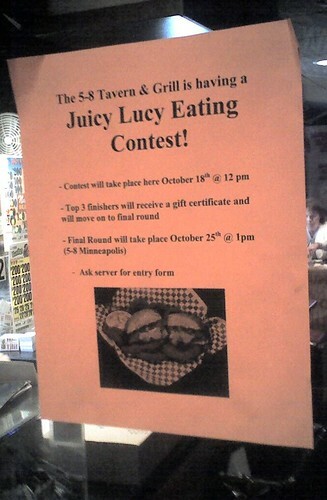 The 5-8 Club is hosting a Juicy Lucy eating contest this weekend. I snapped this photo at the Maplewood location near 3M so I’m not positive that it’s at all locations but as I understand it, this is the prelims at their locations with the finals a week later after a full recovery. I dined on a classic Lucy while I was there. American cheese with fried onions and a side of delicious JoJo potatoes. If you’re in on this dining competition, let us know, and let us know how it turns out. So, how does one dominate in a Juicy Lucy eating contest? What are the rules? Are blow-outs acceptible? Are you expected to lick the cheese off spectators? Time will tell. East-Lake.net’s Brian Moen drove West on Lake to Common Roots Cafe to check out the newest Jucy Lucy in Minneapolis known at the Rootsy Lucy. Read his review here. This is currently a limited edition menu item, so go give it a try while you can. 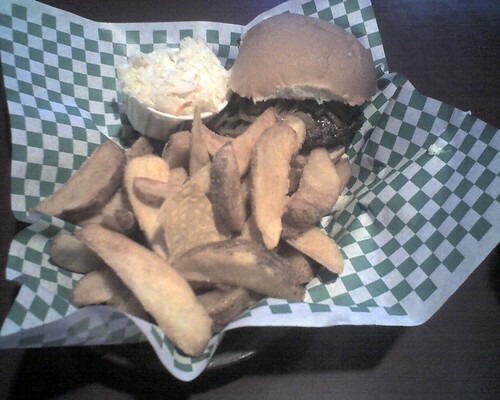 Lazy Lightning’s Bill Roehl has posted a review of the Juicy Lucy at Farmington, MN’s Gossips Bar & Grill. Sounds like he liked both the Lucy and the accompanying fries. Check his site for the full review. Gossips location information. Contribute what you know.